Unmanned Capabilities are the Entering Argument. The increased use of unmanned vehicles appears to be a natural, desirable, and obvious progression of current trends. Capabilities of unmanned systems (such as increased dwell time, and performance of dull, dirty, and dangerous tasks) suggest greater utility in the future. These attributes of unmanned systems solve current operational problems with point solutions. Success in Iraq and Afghanistan portends increased unmanned systems use across the entire military. Increases in technology suggest commensurate increases of unmanned systems capabilities that will bring even greater benefits through their tactical and operational use. These trends extend into a basic argument: since unmanned systems have proven effective in combat and may bring increased capabilities against future challenges, the Navy should procure and employ more unmanned systems. While a start, this argument, if unguided by overarching concepts of unmanned integration, has serious flaws. Holistic Approach Could Increase Effectiveness. Incremental projections of today’s successes do not look sufficiently far into the future, may not scale effectively across the force, and may fail to realize the maximum benefits that a holistic implementation of unmanned systems could produce. Simply adding unmanned systems without examination of restructuring Navy forces may miss unseen opportunities of unmanned systems such as realization of a free form force and enhanced development of distributed, flexible, and agile forces employed in yet undiscovered operational ways and means. Balancing Risks and Rewards. Uncertainty over both the exact capacities of future unmanned systems and the challenges of specific future threats complicates the integration of the former. A mismatch between future capabilities and challenges represents risk to both the Navy and the nation. Unmanned systems are one portion of the overall future capability of the Navy. Ad hoc procurement of more unmanned vehicles, devoid of an overall concept of their use in the context of the entire naval force and the uncertain threat environment, will increase that risk. A concept of unmanned systems usage must address a variety of possible futures in order to utilize unmanned assets in a way that maximizes rewards and best mitigates risk. Man and Unmanned. A continued increase of unmanned systems without analysis of the relationships between manned and unmanned systems as integrated pieces of the whole Navy force may miss opportunities to achieve the “sweet spot” between manned and unmanned systems. Future force structure should not be based on predetermined numbers or ratios of unmanned systems, rather the force should be built to maximize the capabilities of an integrated manned and unmanned force. What do we want to “Unman?” Unmanned systems are often described as being more capable, cheaper, less risky, and less manpower intensive than manned systems. While these perceptions may be true, further study in a broader context is required to determine the validity of these points. Examination of unmanned attributes and their projected futures will provide better metrics to establish what roles are best unmanned. The SSG will analyze potential capabilities and benefits of unmanned systems contribution to total Navy capabilities across a range of alternate futures while seeking concepts that add the most value and reduce risk amidst uncertainty. Unmanned integration recommendations are not new. 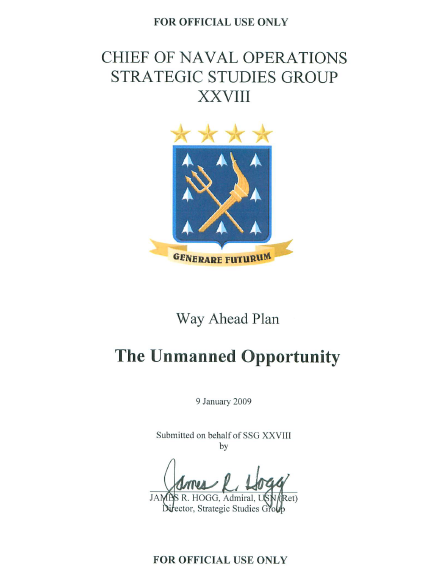 Since 1995, several SSGs have included elements of unmanned systems in their reports. SSGs XXIV and XXV provided detailed information on what came to be called the “Free Form Force.” Uniquely, this force was scalable, adaptable and relied heavily on unmanned vehicles of several types and sizes that operated on and under the sea, and in the air. SSG XIX introduced the concept of FORCEnet, an operational, netted architecture which provided the necessary battlespace in which the Free Form Force could most effectively operate. SSGs XXVI and XXVII focused on cyberspace and the Navy’s role in that environment. SSG XXVIII believes that the work of these previous SSGs is highly germane to this year’s topic, and that an operational concept for full integration of the work of these earlier SSGs may be furthered in our work this year. Our Overarching Concept—The Unmanned Opportunity— provides a preliminary operational framework for the year’s work. It is not intended to be exhaustive, and will evolve with continuing research. – Entity – The lowest divisible level/element of a taskable unmanned or manned unit (e.g. a vehicle, sensor, weapon, or cyber element). This definition assumes the support structure behind each entity exists when it is designed. An entity may operate individually or be grouped together with other similar or dissimilar entities to fulfill capability requirements. – Naval Force Package – An operationally and logistically integrated combination of entity groupings (from one to many) containing the command and control for these groupings, the organic logistics and sustainment structure supporting the grouping, and the pool from which the entity groupings are constituted. The package generates operational effects through coordinated use of the entity groupings, and is provided to the Joint Commander to fulfill a mission or set of missions. The Naval Force Package is a sub-component of a larger Joint/Coalition/Interagency force. The Navy must adapt to evolving missions sets. Maximizing naval mission effectiveness will require the integration of manned and unmanned entities in all domains (land, sea, air, space, and cyberspace). This integration will also provide new opportunities for mission accomplishment that will revolutionize concepts of operations and related doctrine, and may render some current missions, systems and approaches obsolete. Integrated and netted manned-unmanned force structure will be a force multiplier. A mission-tasked Naval Force Package, comprised of heterogeneous groups of manned and unmanned entities—fully deconflicted throughout the battlespace—will provide a more robust capability to the Joint Commander. Realizing Free Form Operations. Integrated Naval Force Packages will be responsive and adaptable to changes in mission, tasking and environment. Manned and unmanned entities should be able to be tasked and employed with equal ease. Resilience will be a centerpiece principle of the integrated force. Naval Force Packages will accomplish the mission or some portions of it despite losses, adversary action or uncertainty, through attributes including self-healing and graceful degradation. Survivable networks and exchange of information will be vital to success. Networked together to increase strength, survivability, and reach, entities cannot be considered just in isolation, but also as part of an integrated Naval Force Package. The challenges are not simple and organizational bias runs deep. Given that the Navy’s current institutional structure has not yet truly integrated manned and unmanned entities into a coherent framework, true integration will likely involve cultural, doctrinal, personnel, and organizational revolutions. Lead the technology race. Complete integration of unmanned entities into Naval Force Packages will present technological challenges. Integration implies the need for development of new innovative technologies, expeditious merging and collaborating of current and emerging technology, and the evaluation of associated technological risks.